BrocShots: Available from New Leaf Natural Therapies! Sulforaphane, ready to activate, drink and enjoy. Sulforaphane was discovered in 1992 at John Hopkins University School Of Medicine. When Glucoraphanin and Myrosinase enzyme are present, once chewed or swallowed they convert to Sulforaphane. Sulforaphane is molecule that is easily absorbed into our bloodstream and genes/cells. Switching on over 200 genes at the same time to help the body detoxify the pollutants in the air and our food, to help slow ageing process, to improve cognitive function and many many more amazing health benefits. Sulforaphane is currently one of the most studied natural substances on the planet by all the major universities. Sulforaphane builds up in our body and is enzyme active. Once the BrocShots Cap is activated, the enzymes have a matter of minutes before dying due to instability of Sulforaphane once activated in water or saliva. We are the world leaders in our growing techniques of NUTRACEUTICALS. Our team are second to none in the world in experience and science of our hydroganically grown Broccoli, Daikon and Kale Sprouts. We search seed banks of the world for our seeds, testing them for the highest levels of BIO ACTIVES BEFORE SELECTION. 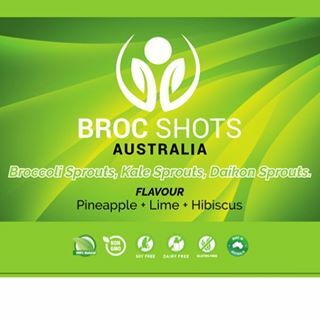 BrocShots Australia’s formula not only produces the highest yielding Sulforaphane product on the market,,,, our formula also produces the highest levels of SULFORAPHENE, (SUL-4-A-FEIN) from our whole DAIKON SPROUT powder, which is scientifically backed to be just as effective for cellular defence as SULFORAPHANE. We grow with nothing but water (HYDROGANICALLY), AND LOVE. We are 100% AUSTRALIAN OWNED, GROWN, and PACKAGED COMPANY. BrocShots Australia tests every batch of our formula with independent laboratories, we have all our COAs (Certificates Of Analysis),WE BACK OUR CLAIMS! Our broccoli sprouts are grown and dried naturally, not freeze dried like our competitors. Freeze drying can kill nutrients in the sprouts if not done correctly. 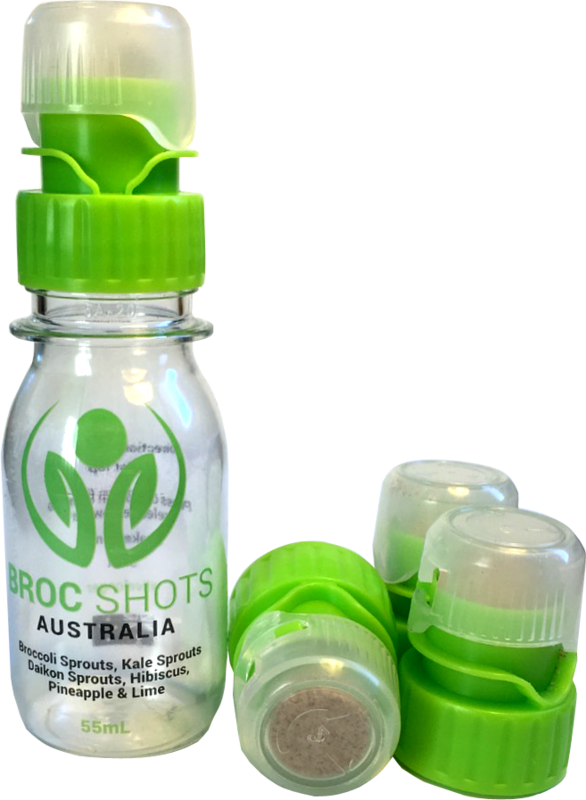 The BrocShots Australia CAP give us an on the “GO” controlled dose wherever, whenever your body needs it. More Vitamins than your daily MULTI VITAMIN. BrocShots AUSTRALIA actually tastes good! It doesn’t taste like all those other GREEN hard to swallow health juices. Can add your own favourite juicer to your bottle, APPLE, PINEAPPLE, GUAVA, instead of water, great for the kids. If anyone has any trouble swallowing vitamins, supplements, which roughly 70% get passed through our bodies anyway. Our water-soluble formula absorbs into the body being effective, easy to swallow, and up 99% absorption of the nutrients. OUR SEEDS ARE NON-GMO! BUT NOT ORGANIC! OUR SEEDS ARE CROSS BRED TO BE ABLE TO GET THE LEVELS OF BIO ACTIVES WE PRODUCE! LETS FACE IT, ITS ABOUT THE LEVEL OF NUTRIENTS AND BIO ACTIVES THATS GOING TO GIVE OUR BODIES THE BEST RESULTS! WE ARE 100% NATURAL: GLUTEN FREE: SOY FREE: DAIRY FREE AND 100% AUSTRALIAN MADE! Q: WHAT IS BROCSHOTS AUSTRALIA? WE ARE A YOUNG AUSTRALIAN COMPANY DEDICATED TO HELPING PEOPLE AFTER FOUNDER/DIRECTOR JAY SILVESTER SOLVED A LIFE LONG ASTHMA ISSUE BY TAKING A DAILY DOSE OF A BROCCOLI SPROUTS. Q: WHATS SO SPECIAL ABOUT BROCCOLI SPROUTS? ACCORDING TO VARIOUS RESEARCHERS (INCLUDING JOHN HOPKINS AND OHIO STATE UNIVERSITY), THEY CONTAIN 1000 PERCENT MORE NUTRIENTS THAN MATURE BROCCOLI. SULFORAPHANE BEING THE AMAZING PHYTOCHEMICAL FOUND HIGHEST IN BROCCOLI SPROUTS. BROCCOLI SPROUTS ARE THREE TO FOUR DAY OLD BROCCOLI PLANTS THAT LOOK LIKE ALFALFA SPROUTS, BUT TASTES LIKE RADISHES. BROCCOLI SPROUTS ARE TOUTED AS THE MOST POTENT CANCER FIGHTING FOOD ON THE PLANET. Q: HOW MANY BROCSHOTS CAN I TAKE A DAY? MOST PEOPLE GO WELL WITH JUST ONE SHOT PER DAY, IF YOU HAVE MORE GOING ON WITH YOUR BODY, THEN TAKE ONE BROCSHOT TWICE A DAY. Q: WHO CAN TAKE BROCSHOTS? ANYONE LOOKING TO OPTIMISE, MAXIMISE, IMPROVE AND ENHANCE THEIR BODY. YES ANYONE FROM EARLY CHILDHOOD TO THE ELDERLY, TO PREGNANT MUMS. Q: WHAT CAN I PUT IN MY BROCSHOT BOTTLE BEFORE I ACTIVATE MY CAP? MOST PEOPLE PUT WATER, BUT YOU CAN USE YOUR FAVOURITE JUICE, APPLE, ORANGE, BREAKFAST JUICE; MILK, SOY MILK…….. JUST NOTHING FIZZY OK. ANYONE LOOKING TO OPTIMISE, MAXIMISE, IMPROVE AND ENHANCE THEIR BODY. YES, ANYONE FROM EARLY CHILDHOOD TO THE ELDERLY, TO PREGNANT MUMS. Q: DO I PUT MY BROCSHOTS IN THE FRIDGE? Q: HOW LONG WILL MY BROCSHOTS LAST BEFORE GOING OUT OF DATE? BROCSHOTS HAS A LONG SHELF LIFE DUE TO OUR AIR TIGHT CHAMBER IN OUR CAP. KEEPING OUR NUTRIENTS AS FRESH AS THE DAY THEY WERE HARVESTED. YOU WILL FIND A USED BY DATE ON THE BOTTOM OF YOUR BROCSHOTS BOX. Q: IF I DONT ENJOY OR LIKE MY BROCSHOTS IN ANY WAY CAN I RETURN THEM? YOU CAN RETURN YOUR BROCSHOTS TO THE PLACE OF PURCHASE FOR A FULL REFUND. Q: ARE THE BROCSHOTS BOTTLE AND CAPS 100% RECYCLABLE? YES THEY ARE. WE ENCOURAGE ALL OUR BROCSHOTS CUSTOMERS TO ALSO RE USE THEIR BROCSHOT BOTTLE BY JUST GIVING IT A SIMPLE COUPLE OF RINSES UNDER THE TAP AND PUT INTO YOUR WASHING UP TRAY OR DRAWER, OR WHEREVER ITS CONVENIENT. Reduce your overloaded inflammatory pathways! ? Amazing sulforaphane product… Increase your genetic potential! !